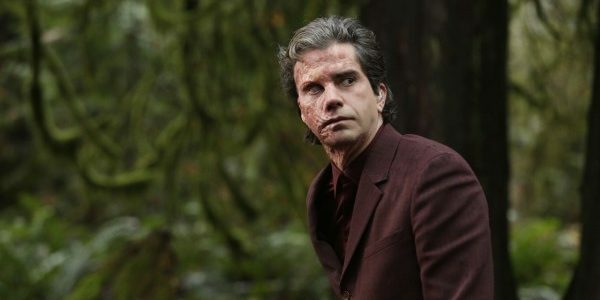 Well, season one of Legion went out with more of a whimper than a bang. Considering how many bells and whistles the season had (and how incredible several of the show's amazing and twisted sequences were), I'm willing to allow a less-than-stellar season finale a pass. But I can't help but feel a bit disappointed with "Chapter 8," which was more concerned with getting us to the starting line for season two than it was with continuing to delve into the interesting world the show has created. The core issue with the episode lay in a line of dialogue David uttered near the episode's beginning, telling Syd that he doesn't want it to be "all about [him]" anymore. And, for the most part, the episode wasn't all that concerned with David. In fact, I found myself realizing, upon finishing the episode, that we really don't know all that much about David. We only know who he is when saddled with the Shadow King as a passenger, and thus don't know if the David we've gotten to know over the course of these eight episodes is the real David at all. Which is a bit of a disappointment, albeit one we all should have seen coming. On that same line of thinking, Syd doesn't really know the man she has fallen in love with, and Melanie can't truly trust him, can she? And on that line of thinking, we really don't know all that much about Syd or Melanie, beyond basic character outlines. Hopefully we get a bit more on all three of these characters next season. Although, all of those musings might be for nought, thanks to that post-credits scene. Yes, there was a post-credits scene. I wasn't all that thrilled with it, personally (I've never been a fan of teasing a moment from an upcoming story, especially at least a year in advance), but we now know that poor David isn't going to get a moment to rest. Rather, he's been kidnapped by some high-tech drone. The obvious culprit would be D3, but I hope it's someone we haven't met. It would be fun to dive into another aspect of the mutant world, and get a better look at how this world works, beyond the limited flashes we've seen. One thing we will certainly get next year is more Aubrey Plaza, which is something I can certainly get behind. Having Oliver take on the Shadow King also means more Jermaine Clement, another big plus. I'm not sure if the show will get to spend much time with the two new antagonists, as I'm sure the search for David will be the focal point of the early episodes of season two, but I'm willing to wait a bit to see how this dream team of actors handles Oliver's new mental passenger. As I mentioned at the outset of the review, I wasn't particularly enthralled with the episode. It all felt a bit paint by numbers, which was a bummer considering how much the series has opted to color outside of the lines to wonderful effect. But a disappointing finale doesn't dampen my enthusiasm for what Legion accomplished during its freshman season. The series threw out the rule book for superhero stories, and rewrote it with the goal of combining style and substance. The "Bolero" sequence in "Chapter 7" was, far and away, the best thing I've seen on television in a long time. The performance of Plaza was a revelation, showing a range in her acting I didn't know she possessed. And, while there were enough X-Men elements to satisfy a fan, the series remained entirely accessible for casual comic fans and newcomers. Not an easy feat when playing with a complex character like Legion. Season one was a success. I'm eager to see where season two might take us. Final Thoughts: -- When Farouk was jumping from body to body, I found myself continually repeating "Well, that's not good" as he made it to stronger and stronger mutants. -- It was an interesting choice to let us see more of the Interrogator's (or, rather, Clark's) life. It wasn't something that I was looking to learn more about, but it was a nice touch toward humanizing the character a bit. I suspect we will get to see more of him next season. -- That make-up job on Lenny was something else. She really went from your typical, dry Aubrey Plaza character to a Tim Burton creation over the course of the eight episodes. It was a glorious thing to witness. -- As soon as Oliver remembered Melanie's name, I knew it wouldn't end well for him. Poor Melanie. -- Speaking of Melanie, we never got confirmation of whether she is a mutant or not. She gave a very Magneto-esque speech about how humans are dinosaurs and that time is ending, which seemed to hint that she might not be a dinosaur herself, but there was no hint as to her having powers throughout the season. -- I was really happy to see Kerry and Cary reunited. Those two are so great together. -- If you enjoyed the interesting visuals, the fun dialogue, and great use of TV tropes, I would recommend you check out showrunner Noah Hawley's other amazing show, Fargo. The first two seasons are on Netflix, and the third season begins April 19th. It's an anthology series, so feel free to jump into season three without any background knowledge.